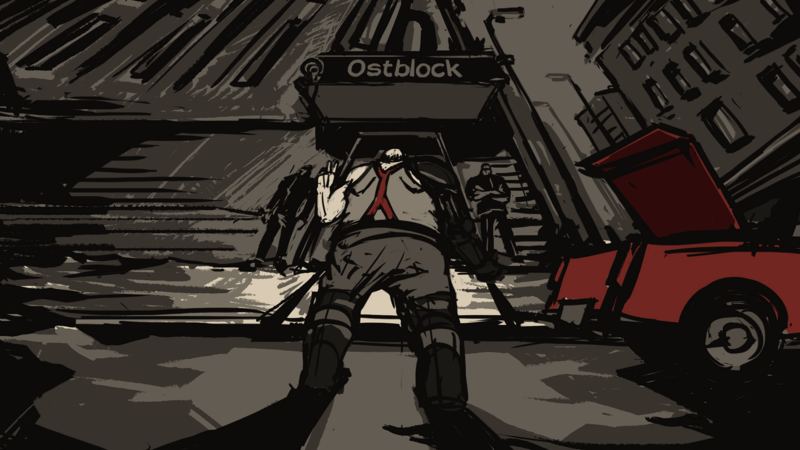 If you eagerly scrolled to the bottom, you already know the Kickstarter game’s All Walls Must Fall‘s final score; a three. However, there needs to be a conspicuous asterisk added in superscript above that middling number; if post-launch updates continue along the trajectory of the Early Access updates, then I’m certain it will eventually surpass this score. My quest to beat the replayable campaign for the first time was fraught with frustration before I caught onto the flow (and balance flaws). Despite that, I do know that with further tweaks and changes, the following critiques will likely age. Either way, as it stands now, All Walls Must Fall is thoughtful, thrilling, and troubled. Inbetweengames (comprised of three ex-Yager employees) succinctly describes All Walls Must Fall as “a very gay, very Berlin, Tech-Noir Tactics game.” In this high concept, futuristic story, the player character, Kai, storms techno clubs following leads on crimes occurring in 2089 Cold War East Berlin in order to prevent an impending terrorist attack. This incongruous setting and component narrative elements act as heavy anchors for a complicated time travel system; an ultra specific scope that grounds the ambivalence of this hopped up future. All Walls Must Fall inherits the thoughtfulness and energy of its pedigree. 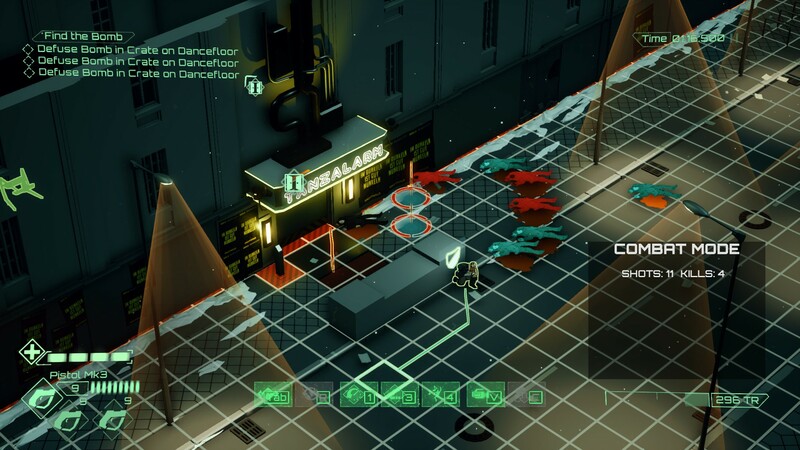 The cross between tactical games (like Invisible Inc) and action shooters (like Ruiner) combine to develop a methodical and John Wick-esque combat system. Time is a resource in All Walls Must Fall (TR, for short). Every tile-to-tile movement, every shot, every dance step, pulls from this resource. Rewinding segments of time to, let’s say, step around a bullet that hit you or to avoid an encounter you instigated, utilizes TR, too. Health, TR, and ammo management inform how Kai staves off scores of enemy agents. He will always be outnumbered, and therefore has to be pragmatic. 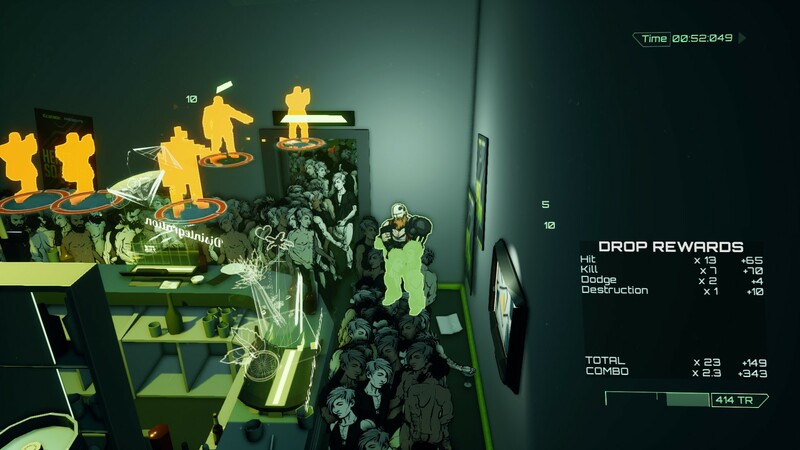 Each second (or beat, use the game’s terminology) is ticks slowly; weaving between bullets, stunning multiple agents, switching weapons, leveraging charmed enemies or hacked drones, are all considerations in any given battle. Your cover will crumble. Time travelling “spectre” agents will teleport around you. Other agents maintain their aggro even after rewinding and will punch through walls to reach you. Every action and movement produces a beat that synchronizes with the music, the sound design of battles intertwines with the environment. Combat is the star of the show, and it takes a good number of hours before the enjoyment wanes. At the end of an engagement, you can rewind to improve the situation, or conclude it by “dropping it” in which a scene of the prior battle plays out in its final version of the timeline, allowing the player to watch Kai dispassionately and expertly execute (but not really because time travel) his foes. This is my favorite part. It was just plain fun to witness my playstyle from shifting and voyeuristic camera’s viewpoint, to see the culmination of my decisions seamlessly playout. However, arriving at these scenes can be aggravating for newcomers. Outside of battle, Kai expends extra TR to rush, and so the most cost effective way to navigate is to limp around the maze of absent minded party goers and concrete slab, tile by tile. Kai can expend precious TR to hack drones, cameras, and locked doors (as opposed to forcing them open) in an effort to avoid conflict. When entering an off-limits room, Kai can flirt, intimidate, or convince guards to let him him by conversing them with them, choosing one of four prompts to affect their dispositions. Yet, this diplomatic approach can be opaque and the costs of rewinding conversations are criminally steep. By failing one prompt, you may find yourself initiating conflict in the middle of a room, with few a thin, barren hallway as your meager staging point. After a while, I realized the “shoot first, flirt later” approach gave me better control over situations, for the most part (except when I aggroed, literally, more than three dozen guards from a single blunder). This all feeds into my major concerns—the learning curve and balance. It takes a lot of experimentation to realize what works and does not. Kai can have as many as three weapons on his person. Fill all three slots with the starting pistol as the other weapons are either worse or too costly to be worth it. Rewindind and undoing previous actions are great! Hacking and speech checks, less so. Combine this with a slow-moving ASDF camera and unclear bullet hitboxes, and at times it feels as though the game conspires against you. But, with the right upgrades and enough practice at opportunistically teasing smaller fights and experience handling the waves of enemies who spawn in, the game goes from being challenging to a romp (unless you turn on permadeath). All Walls Must Fall is a neat roguelite. It’s polished and balances the upbeat sound design with the dark, nihilistic realities of the world. As I said above, All Walls Must Fall may be at 1.0, but it still has time to grow. And indeed, there are reasons aplenty to play now. Daily challenges, branching campaign missions, and a dreary, techno world to breath in.